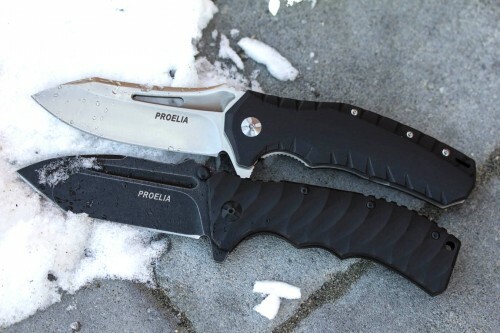 The Proelia Tactical Folders are made in China, but are definitely top quality knives. They’re another wonder, like Kizer and Reate, of how you can get quality craftsmanship with great materials for a competitive price. The blades are made from D2 tool steel and available in a utilitarian drop point or tactical tanto shape. The KVT bearing systems give them very, very smooth opening action and makes them extremely enjoyable to fondle. These are great designs and well executed knives, see for yourself at www.knifecenter.com.